A small crab-like pokemon scanned the board. "Let's start out small, Scarlet. Hmm... oh! How about that one? he said. A Cyndaquil sat upon his shell and bent down to gaze into his eyes. She seemed unsure. "Which one?" she asked, not even thinking to look at the board first. Leroy shook himsself, knocking her over. "Get off!" he snapped. He looked up and pointed at a torn and crumpled piece of paper. The writing was smeared, but readable. It read, 'This place is so big, I thought I could find my way out, but I was wrong. Help!' The Dwebble crawled out of his shell and clambered on top. He easily swiped the paper from the board. He could see it more clearly now. "Scarlet. Get ready, because we're heading to the woods! The two stopped, facing tons and tons of towering trees that loomed over them. Scarlet frightenedly hugged Leroy's rock-shell. "Scarlet," he said, staring out at the trail leading into the forest. "We're a rescue team, and that means we have to be strong and courageous. Now stop being a baby and get off!" For the first time, the fire pokemon actually listened to him. She slid down and the duo walked into the dungeon- er.. forest. Sounds of pokemon howled arond them. "L- Leroy! Do you think there are Poochyena out here!?" she cried, staying close behind him, even though she was team leader. Without an answer, she reluctantly stepped in front of him and lead the way. The trees smacked them with every brach they held close to the ground. Scarlet winced in pain, but she urged herself forward. Leroy had no problem with the protection of his shell. There was a rustling heard close by, and Scarlet stopped in her tracks. Growling crept from the bushes and the Cyndaquil let out a soft squeal of fear. A small foot stepped from the bushes and Scarlet let out a loud cry. She staggered backwards from the creature and crawled underneath Leroy's shell for protection. A small Oddish waddled out from the bushes and stops in front of them. It looked friendly, but it wouldn't budge from the spot. Leroy couldn't help but laugh at his partner. He began walking forward and suddenly, he felt himself being sent backwards into a tree. Scarlet tumbled out of his shell and she smacked into the ground. She rubbed her head. "Leroy! Let's teach this pest a lesson!" she said, some spirit showing now. 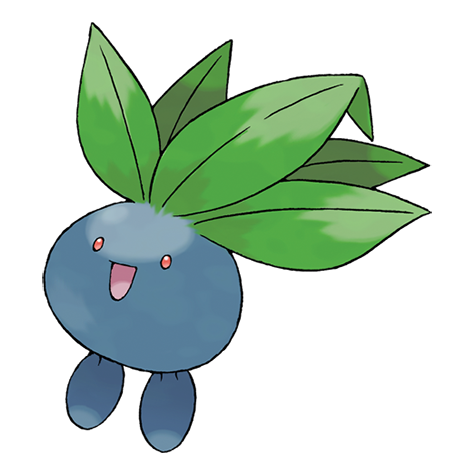 The Oddish laughed mockingly at her. Scarlet set her foot down angrily and she bolted herself forward. She bowled into the Oddish and hopped back as it spiraled into a tree. It slid down and glared at her menacingly. It quickly lit up, and Scarlet felt pain coarse through her body. She felt something whip out of her quickly. Oddish's light faded and its wounds were healed! "It's called Absorb, you little rookie! Odd!" Scarlet let out a growl of anger and she slammed into the Oddish once more. It easily hopped up and tackled into her too. Scarlet lay on the ground and panted. The Oddish stood over her, smiling. Oh-no! My first mission and I blew it! she thought sadly. Suddenly, something tumbled into Oddish. A rock? No! It was Leroy! The Oddish fell to the ground and let out a defeated groan. They did it! They really did it! Scarlet nudged the unconcious Oddish. Hah! How's that for a rookie? she thought triumphantly. They continued onward until they saw a hole. Brambles and sticks twisted over it. They walked forward and peered down it. Were these.. stairs? Scarlet and Leroy cautiously went downwards to the next floor. The two tumbled down the stairs after tripping on a vine that stuck out. They landed on the same terrain as before, but there were leaves scattered here. The grass felt good on her weakened body and she lay down exhaustedly. "Scarlet, we only went down one floor. We have three more to do," Leroy said, nudging her up. Scarlet let out a heavy sigh. She managed to get up and the twosome continued walking. 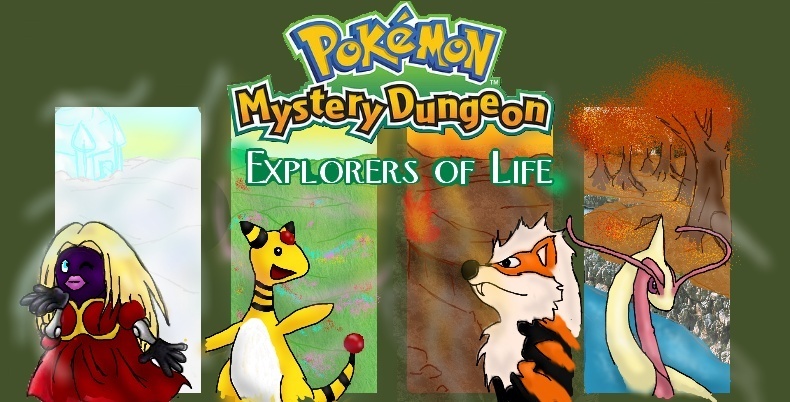 At this point Scarlet just began to look at the scenery instead of focusing on the noises of pokemon around them. Leroy must've began to get worried of her injuries because he stopped abruptly and pulled out an Oran berry from their bag that he kept securely in his shell. "Eat it," he urged. Scarlet greedily snatched the berry and gobbled it down, not stopping to say a thanks. She just patted his hard shell and continued, a skip in her step. Scarlet and Leroy stopped and whipped around the corner to hide. They had just witnessed an Ekans slithering past. It's eyes were glazed with hunger and irritation. It hissed and muttered something to itself as it began to head towards their direction. Thankfully, a flock of Pidove soared above their heads and that got the Ekans' attention away from them. It began to slink away and they breathed a sigh of relief of their luck and walked on. Leroy crawled around, hopelessly looking for the next flight of stairs. He went on until Scarlet stopped and walked a different direction. "Scarlet! Where are you going?" he snapped, turning to follow her. She walked around, looking quite unsure about something. "Something's not right.." she said. She walked forward slowly. Suddenly, her feet gave way and she slid right into a hole! The stairs! They were covered as a pitfall trap! Leroy, his eyes wide with surprise, waddled after her, easily sliding down the hole to the next floor. Leroy slid down into a flowery patch of grass. He spotted Scarlet, her face planted in the ground, and her mouth full of flowers. He let out a hearty laugh and tugged her free from the ground. "Well don't you have some rosy cheeks!" he teased as she spat out roses that were stuffed in her cheeks (face ones .3.). They continued forward. Scarlet began to get bored. She heard a twig snap behind her and she whipped around. No one. Oh, it was just Leroy. His eyes were wide with fear. She turned in time to see a bird-like pokemon skimming her head. Its talons were stretched out as it whipped around angrily. It was obviously mad. It flapped its wings powerfully, sending leaves, dirt, flowers, and mostly wind, smacking into the rescue team. A twig scratched her cheek and she angrily hopped onto Leroy's shell and leapt up to confront the bird. 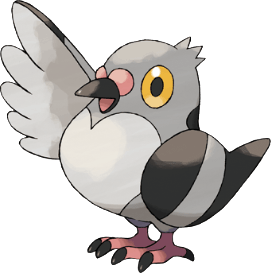 As she closed in, she saw that it was a Pidove. She whacked herself into it, and they both fell the the ground, feeling the air around them close in as they plummeted towards the earth. The Pidove took hold of her and gripped her sides. Scarlet tried to tear free, but she felt herself come in contact with the soft ground. She felt it crash beneath her. She weakly rolled away into the safety of some bushes. Leroy suddenly spiraled into the Pidove and stopped to look at it. It apparently was going to give Leroy a real fight. It began to whip its wings at him. As it did, he let his shell cover his entire body. He felt it shake and rumble as the winds whipped against his shell. It suddenly toppled over and he flew out. His body bare, Leroy hurriedly scrambled to the safety of his shell. The Pidove sat upon it, cawing a warning. It swiftly got knocked over by a panting fire pokemon; Scarlet. She had already eaten another Oran Berry! She was so greedy.. The Pidove plopped onto the ground. It lay there still, its body unmoving. Yet another pokemon taken down! They stopped for a quick rest. They sat on a tree stump and took out two Apples. Leroy ate his quickly as Scarlet bit into hers slowly, taking in all of the flavors. It soothed her, and it washed away the pain. Afterwards, they set off again. Leroy and Scarlet now spotted the stairs, which, of course, Scarlet tumbled down. "Scarlet! You're such a goofball!" Leroy sat down for a quick break. He brought out a slip of paper and read it; the job they were assigned to do. "According to this paper, we're on the right floor. Look for a Zigzagoon, alright?" informed Leroy. He tucked the paper back in his shell and they continued onward. Suddenly, out of nowhere, screaming emitted from the room next to theirs. The rescue team warily went into the room. Two pokemon huddled a small Zigzagoon. "C'mon, bub, where's the loot? We don' have all day, bub." "Yea, squirt. Now hand over your money, squirt and there won't be any problems at all. None at all, squirt, ya' got that?" Their identities were hidden since their backs were turned, but before the team could ambush them, Zigzagoon cried out, "my goodness! My heroes! I knew you would save me! These mean bandits are trying to hurt me, my goodness! Teach them a lesson!" "Ey', I have an idea. Let's just beat these squirts and take their loot, too!" suggested the one with the silver necklace. The other nodded and the stepped forward. "Poison sting, brother!" Gold said. They both crossed their arms and prepared to fire. Scarlet and Leroy just sat there in awe. They whipped their arm out and needles were sent towards them. "Augh! Fury... CUTTER!" cried Leroy, spinning towards them, knocking one stinger out of the way. He sliced his claw into Silver and left him skidding on the ground. "You're gonna regret that, squirt! Revenge!" The Cacturne sat there, glaring at Leroy. He spun at him again, and as he did, he smacked into Silver, only to be flung across the room, and smacking into a tree. Scarlet evaded the Poison Sting barely. She glared at Gold and tackled into him. He easily got back up and sent another Poison Sting at her. Leroy weakly scrambled back up. He easily struck the golden-necklaced Cacurne with his Fury Cutter. He swiftly used his shell to block the Poison Sting attack, but he went too high and it sliced through his tough skin. He winced in pain and felt something coarsing through his veins. He ignored it, however and sliced into Gold again. Gold was sent bowling into his brother, whom was about to send out another attack. They got up weakly. Scarlet stepped next to her partner. He winced in pain and his body convulsed. He was poisoned. Scarlet quickly tackled Gold, making his lay there still. Silver quickly slammed into her, making her slam and collapse by a tree. She shuddered weakly. Leroy didn't give up. He stood up and faced Silver. His partner was obviously too weak to even think about getting back in the battle. He put his foot down and rammed into Silver. As his body pressed against his in midair, Silver unleashed another Poison Sting. Leroy fell to the ground and howled with pain. His small body crunched up in pain. He wasn't going to give up so easily. Silver surely wasn't either. As the Cacturne gave a wicked smile, Leroy gazed around at the trees. They were aligned perfectly. He got up faster than the blink of an eye and spiraled towards Silver. As planned, he ducked away and he felt himself hit a tree. He spiraled to another, than another until he was bouncing everywhere. This overwhelmed Silver and he got up to retreat. As he did, Leroy knocked into him. And again. And again. And again. Easily, Silver collapsed onto the soft ground. Leroy slowed himself down and pushed off from a tree to the ground. He gazed at the two battered Cacturne. 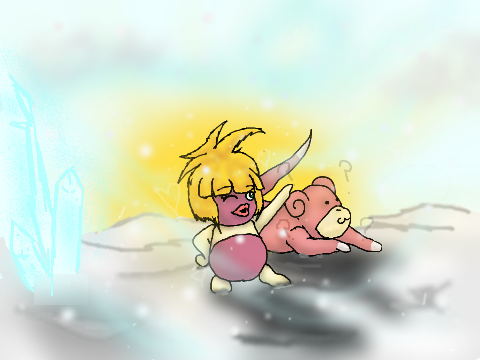 "Y- you keep your loot, bub.." panted Gold. "Yeah. We- we were just warming up. But.. you remember us, alright squirt?" breathed Silver. A thankful Zigzagoon bounced towards them. "My goodness! Thank you! Thank you! My heroes! Who are you?" Leroy blinked and looked at Scarlet, who was now coming from laying limp by the tree. She panted and leaned on him. "And we are Team Destiny!" they cried in unison. "Scarlet?" Leroy asked, feeling as if a big load had been taken off his shoulders. "Remind me not to take anymore damn jobs ever again.."
When they would all return to the guild, Zigzagoon would present them with a pouch full of 200 Poke and a thankful glance. "Thanks again!" Subject: Re: Team Destiny's First Mission!